The fun isn’t over once the wedding is celebrated and you are back from your honeymoon. You have many years to look forward to with your significant other and each milestone should be celebrated to the fullest! Anniversary Tees saw an opportunity to offer anniversary shirts to help couples commemorate each and every year they spend together. 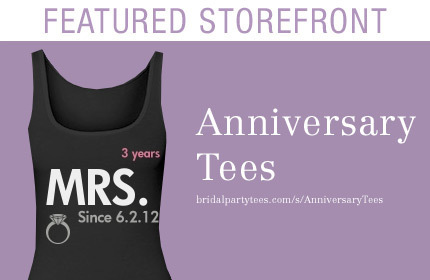 It’s a unique concept that not many online businesses have pursued and that is why Anniversary Tees is Bridal Party Tees storefront of the month. 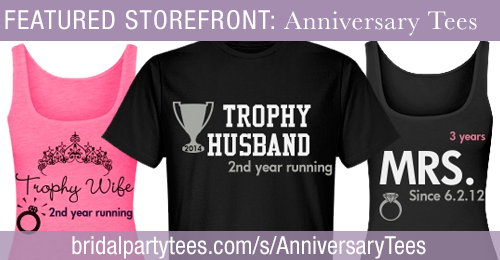 Each design in Anniversary Tee’s storefront can be customized to include names, dates, and even the option to upload a favorite photo but what makes their storefront so great is that these designs are already fabulous without the customization factor. Bridal Party Tee’s offers the trendiest apparel online and there’s no way you won’t find a tee, tank, or accessory that won’t fit your style.